Lance Stephenson of the Indiana Pacers celebrates with fans following Game 7 of the Eastern Conference Quarterfinals against the Atlanta Hawks on Saturday in Indianapolis. 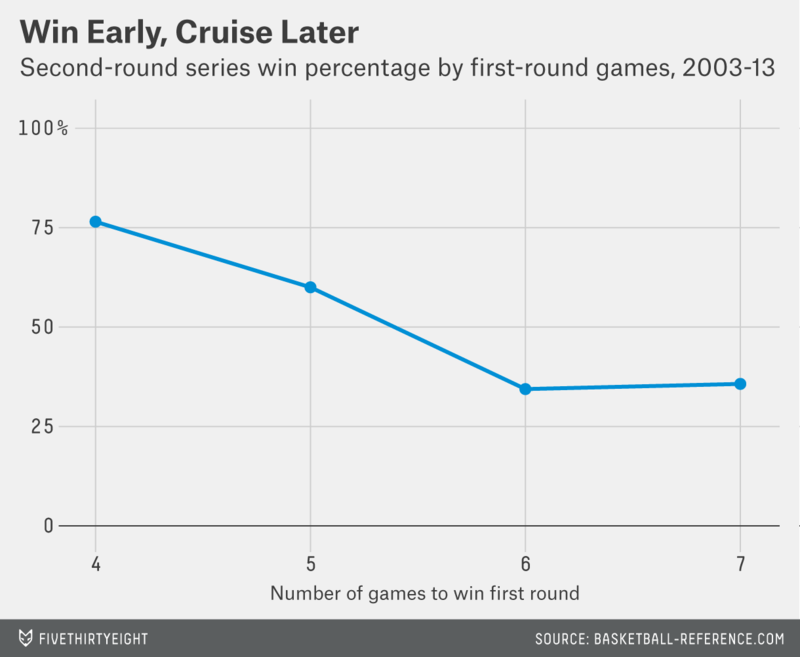 A close call in the first round of the NBA playoffs doesn’t always doom a team. In 2008, the Boston Celtics, coming off a 66-16 season, needed seven games to get by an Atlanta Hawks team that had gone 37-45. But they wound up winning the NBA title. Those Celtics, however, may be more the exception than the rule. In fact, an extended first-round series is often an ominous sign for the winning team. If recent history is any guide, then this year’s Indiana Pacers, who needed seven games to defeat this year’s Hawks, may be no better than even money against the Washington Wizards, whom they begin playing Monday night. Since the NBA went to a best-of-seven first round in 2003, teams that swept their first-round series won their second-round series 76 percent of the time. Teams that needed five games to beat their first-round opponent won the next series 60 percent of the time. But those teams that needed six games to win the first round won the second round only 34 percent of the time, and those that took the full seven games did just 36 percent of the time. We can then average a team’s margin of victory or defeat throughout the second round and compare it to what was expected from its SRS. The advantage of this approach is that it accounts for a team’s overall strength and that of its opponent based on each team’s regular-season performance. This analysis produces some highly significant effects. On average since 2003, teams that swept their opening-round series outperformed their SRS projections by 3.0 points per game in the second round. Those that took the full seven games in the opening round did much worse than expected in the second round, by contrast, underperforming their SRS by an average of 5.7 points per game. These are enormous differences in the context of highly competitive playoff series. We can use this regression analysis to estimate how much this year’s first-round playoff series should affect a team’s odds for the second round. We accomplish this by computing the probability of a team winning its second-round series based on its regular-season SRS,5 and then, alternatively, with a modified version of SRS that accounts for how many games it took to win the first round and its average margin of victory in those games. Original SRS odds: Indiana 76 percent to win the series. Modified SRS odds: Indiana 54 percent to win the series. The formula has the Pacers going from being 3-to-1 favorites to beat Washington to about even money. This is obviously something of an extreme case of a No. 1 seed struggling and facing a No. 5 seed that played very, very well and is much better rested. I might be biased since I’ve been called a wizard, but I can buy that the series is about even given how much Indiana struggled late in the regular season. Original SRS odds: San Antonio 78 percent to win the series. Modified SRS odds: San Antonio 69 percent to win the series. San Antonio needed seven games to beat Dallas, but Portland took six to beat Houston in a very competitive series. Part of this, however, is that the Spurs had more to lose, since they were heavily favored against Dallas while Portland wasn’t against the Rockets. Original SRS odds: Los Angeles 51 percent to win series. Modified SRS odds: Los Angeles 52 percent to win series. SRS had this series as a toss-up before, and since both the Thunder and the Clippers took seven games to win their first-round series, nothing much has changed. The good news for the Pacers is that if these results are mostly about fatigue, they could reset the table by beating the Wizards relatively easily. The bad news is that they aren’t likely to do so: The formula gives Indiana only a 21 percent chance of beating Washington in four or five games. By contrast, it gives Miami a 33 percent chance of sweeping Brooklyn, and a 70 percent chance of winning in four or five. So the Pacers’ plodding performance is likely to catch up with them sooner or later, even if they get by Washington. I’ve lumped the six- and seven-game series together in this description because the sample size is otherwise small. From 2003 to 2013, only four No. 1 or No. 2 seeds needed the full seven games to win their opening series. (These were the 2003 Detroit Pistons, the 2006 Phoenix Suns, and the 2008 and 2009 Celtics.) Three of the four (all but the 2009 Celtics) also won their second-round series. On the other hand, of the nine No. 1 and No. 2 seeds that took six games to win the first round, just five won the second round as well. For instance, in the 2012-13 regular season, the San Antonio Spurs had an SRS rating of 6.76, while the Golden State Warriors had one of 1.32, a difference of 5.44 points. When these teams played second-round games in San Antonio last year, giving the Spurs an additional boost of 3.2 points based on the home-court advantage, this projection would have favored San Antonio by 8.64 points total. For instance, if a No. 1 seed that was favored to win each game by 10 points sweeps the opening round, but does so by winning four games at the buzzer instead, that could imply the team was overrated, even if it’s going into the second round fresh. The coefficient on the first-round margin of victory variable, netsrs_rd1, is about 0.14. 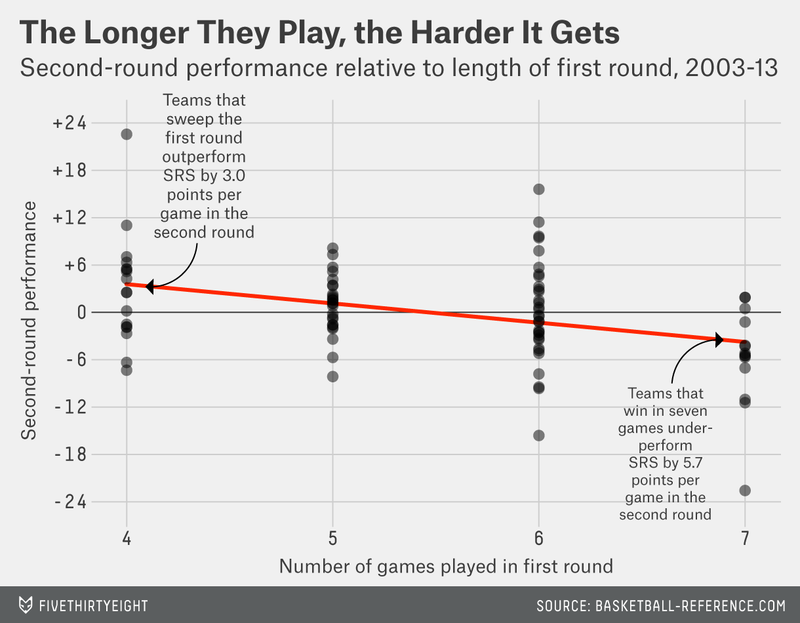 This implies that a team’s performance relative to its SRS in the first round of the playoffs tells us about 14 percent as much as its regular-season performance. This is a bit more than you’d expect if first-round playoff games were as important as regular-season games in predicting a team’s future performance. A team that plays 82 regular-season games will have played 5 percent and 8 percent of its overall games in the playoffs after the first round is completed, depending on how many games its opening series lasts. That the coefficient is 14 percent, rather than something in the range of 5 to 8 percent, implies that each playoff game is two or three times more important than a regular-season game in predicting a team’s future playoff course. Interestingly, this corresponds to the extra significance attached to opening-round games in the NCAA basketball tournament. However, our estimate of the coefficient is not very precise, so we should be careful of making too much of this result. The calculation works by computing the probability of a team winning each game of its second-round series based on the Excel formula NORMSDIST((SRS_team-SRS_opponent+HCA)/11.3) where SRS_team is a team’s SRS, SRS_opponent is its opponent’s SRS, and HCA is home-court advantage, which takes a value of 3.2 when the team is playing at home and -3.2 for road games. Once we have an estimate of a team’s win probability for individual games, we can run through all possible sequences of wins and losses in a best-of-seven series and compute the team’s probability of winning the round. The second-round series odds based only on the first-round regression are as follows: Washington, 65 percent likely to beat Indiana (!! ); San Antonio, 60 percent against Portland; Miami, 99 percent (!) against Brooklyn; Los Angeles, 52 percent against Oklahoma City.